Review of Alfa Romeo Stelvio, representing the new crossovers of 2017-2018 and the first crossover Alfa Romeo, with photo video, price and bundles, technical characteristics of the novelty Alfa Romeo Stelvio. Just note that the new Alfa Romeo Stelvio is a model Alfa Romeo Giulia in a crossover garment. The cars, of course, have a common platform, motors, gearboxes and even interior decoration. That’s just Stelvio looks more solid than a four-door saddle with a beautiful name Julia, and the crossover is equipped with a standard all-wheel drive Q4. It is also necessary to note that the 510-strong Alfa Romeo Stelvio Quadrifoglio is the fastest crossover in the class today. The Italian model overcame the legendary track at the Nurburgring in 7 minutes 59 seconds. The 570-strong German crossover Porsche Cayenne Turbo S performs this exercise for 7: 59.74, less powerful 520-horsepower Porsche Cayenne Turbo for 8: 13.0, and the British crossover Range Rover Sport SVR with 5.0-liter 550-horsepower V8 for 8: 14.0. Italian designers have awarded the new crossover brand Alfa Romeo excellent stylish and original body. Consider the novelty of the most expensive version of Stelvio Quadrifoglio (the basic versions do not look so aggressive and sporty). 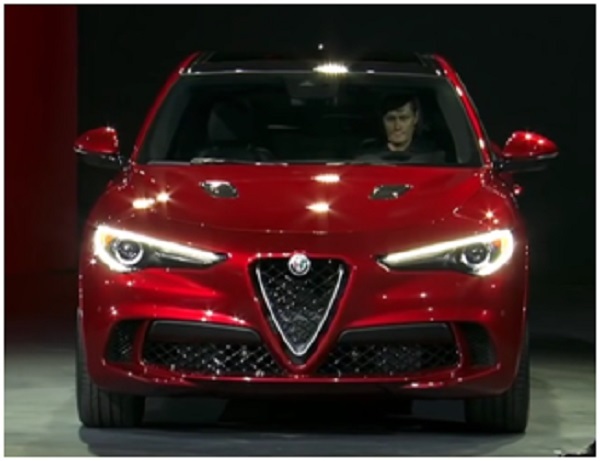 The front part of the body of the model Stelvio demonstrates almost complete resemblance to the design of the front part of the body of the sedan Giulia: amazingly stylish headlights of the head light with LED bends of daytime running lights, the proprietary Alpha shield of the falshradiator grille, bumper with a huge air intake and pronounced aerodynamic plumage. In the profile of the Italian carpenter’s body looks as original and aggressive: a fluffy hood, blown surfaces of wings and doors, huge cutouts of wheel arches, a line of roof falling down to the rear of the body flowing onto a powerful stern. Evaluating the back of the body of the crossover, we immediately understand that we have an Italian car in front of us — the fodder with highly placed neat lights of the parking lights, the original shape of the tailgate and the bumper looks so refined. The external overall dimensions of the body of the Alfa Romeo Stelvio 2017-2018 are 4686 mm in length, 1903 mm in width (including external mirrors 2163 mm), 1650 mm in height, with a 2820 mm wheelbase. The crossover in the Quadrifoglio version comes standard with 21-inch forged wheels with original design and low-profile 255/40 R21 tires. The crossover body is modern and, understandably, advanced. The hood, doors and roof of a car made of aluminum, the power frame of a body made of heavy-duty steel with a wide use of carbon parts, from which also produced cardan and part of the details of the aerodynamic body kit. The salon of the new Italian crossover is five-seater, and the useful volume of the luggage compartment is quite impressive — 680 liters. The seats in the first and second row are enough for comfortable accommodation of the driver and four passengers. The most important thing in the salon of the novelty is, of course, the driver’s workplace. The front part of the salon is captivated by the convenience of placing the equipment and the laconic interior design. There is a multifunctional steering wheel with optimum rim thickness and tides in the right grip positions, a highly informative instrument panel with large tachometer and speedometer radii, supplemented by a color multifunctional on-board computer screen, a strict front panel with an 8.8-inch color screen of the Connect 3D Nav multimedia system and A simple form of the center console with a convenient climate control unit. A wide tunnel between the sports seats of the first row with excellent lateral support rollers, on the horizontal surface of which there are three washers that provide control: multimedia system, chassis settings (Alfa DNA system with four modes Dynamic, Natural, Advanced Efficiency and Race) and Alfa Chassis Domain Control. As a finishing material, a combination of natural and artificial leather, fabric, wood and carbon fiber. Technical characteristics of the new crossover Alfa Romeo Stelvio 2017-2018. Presented in the photo, the most powerful and expensive version of the Alfa Romeo Stelvio Quadrifoglio is equipped with a gasoline 2.9-liter gasoline engine with a double turbo (510 hp 600 Nm) paired with 8 automatic transmission, Q4 all-wheel drive system and Torque Vectoring system. The dynamics of acceleration from 0 to 100 km / h in 3.9 seconds, the maximum speed of 285 km / h.
The suspension is completely independent (front double wishbones, rear multi-link) is referred to as the AlfaLink manufacturer. Carbon-ceramic disc brakes from Brembo. According to preliminary estimates, the Stelvio Quadrifoglio version will receive a price tag around 68,000 euros. Under the hood of more simple and affordable versions of Alfa Romeo Stelvio, a diesel 2.2-liter engine will be prescribed in three variants of forcing — 150 hp 380 Nm, 180 hp 380 Nm and 210 hp 470 Nm, as well as gasoline 2.0 Turbo (200 hp 330 Nm and 284 hp Ls 415 Nm). All motors in the company are exclusively with an 8-speed gearbox, the drive is full by default.